This is a line often said by Doc McStuffins to her toys when they are about to be seen as being real by her brother, her parents, or her friends. This is one of Ian’s favorite shows, which airs on the Disney Channel. He enjoys watching the adventures of Doc and her toys – Lamby, Stuffy, Chilly, and several others. Doc takes care of them and other toys who get hurt or broken. Not only is it fun seeing the bond they have, but also the show encourages children to not be scared of going to see the doctor, the doctor’s examination, or the doctor’s office. Several lessons are being taught in a fun and entertaining way. Lamby is a ballerina lamb who loves to cuddle. Stuffy is a brave dragon who likes a good joke. Chilly is a stuffed snowman who is always thinking he will melt. They have grown on me and on Ian as well. He plays the same way with his own toys. They come to life for Ian and it is an amazing thing to see. Ian has a few favorite buddies who are now constant companions. Mouse the Mouse is currently his best stuffed friend. They do almost everything together — like going to the potty, playing, and planning the day. And, Ian does a great job at making Mouse the Mouse talk. He has a higher voice than Ian’s voice. I am seeing his creativity and gift of storytelling expand each day by the interaction he has with his stuffed friends. His imagination is amazing and inspiring. The entire world is open to him to learn about and this is one small way he is learning. In addition to Mouse the Mouse, one of Ian’s faves is his giraffe with a very short neck named Gerry. Regarding Gerry, we discussed the fact that all of us are different, look very different and that it’s okay not to have to look or be a certain way. Two other favorites are Baby Mickey and Big Mickey. They too are helping him learn to take care of himself and others. Mouse the Mouse is from the amazing “If You Take a Mouse to School” book series. 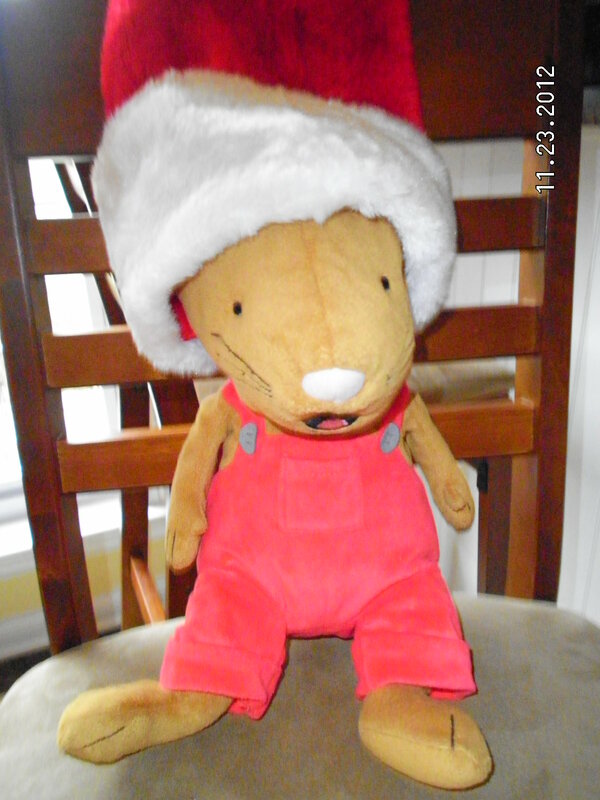 He is pictured above with his Santa hat on. We took this picture as we started decorating for Christmas last weekend. Seeing Ian play with his toys and his love for the Doc McStuffins show has made me think of an amazing book that was one of my friend Dawn’s favorites — The Velveteen Rabbit by Margery Williams. I have been thinking about that story as I see Ian play with his toys that are alive in his eyes. Such love not only applies to toys in my opinion. We can love each other that way too — unconditionally and without judgement. Wouldn’t that be amazing if we could love the way that children love? Toys are alive and well and truly loved in the Cates house. I hope they are in yours as well! Good morning and happy Monday! Hope that you had a great Thanksgiving! Pictured as my new header are some of the wonderful pies that we had for Thanksgiving lunch. My parents had more than 20 family members at their house for the day. It was glorious. Catching up with family was fantastic as was the food. The entire weekend was full of family and so much fun! 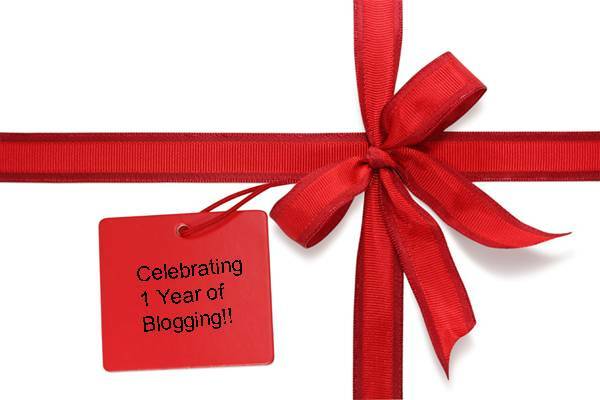 This week marks my 1 year of blogging. A year ago this weekend, I signed up for my blog. I got an anniversary note from WordPress, which was a nice touch. I have loved having this site to write on and share my thoughts and feelings. I am so thankful to you my readers as well! You mean a lot to me! Thanks so much for my followers and all of you who have commented on my writings. WordPress keeps a count of the blogs that are written and I am now almost to 130 postings. That seems amazing to me as the year has flown by. I have been writing a few times a week throughout the year. I hope to increase the number of blogs that I write this next year. Please let me know about ideas that you have or items that inspire you. I’d love to hear from you and share them! We can find inspiration for many things in the most unlikely places. Thanks again for the support! Here’s to another year of blogging!! Yesterday was my cousin Pam’s birthday! I was late on my posting since I wasn’t on the computer at all yesterday. Pam, so sorry this is late! I did think about you all day yesterday and hoped you had a fabulous day. 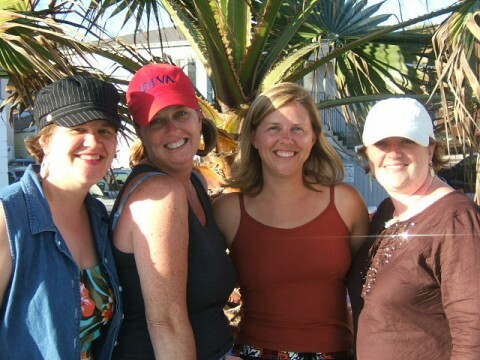 Pictured at left and from left (in 2006) are me, Pam, my sister Cindy, and my sister-in-law Beckie. These three gals are my sisters and I am so blessed to have all of them in my life!!! My cousin Pam is one of my favorite people! We have been friends for as long as I can remember. Growing up, Pam was my cool cousin from California! I always looked forward to hearing about her adventures and seeing her in the summers when the families would get together. We had such fun together in the 1980s and before and since. 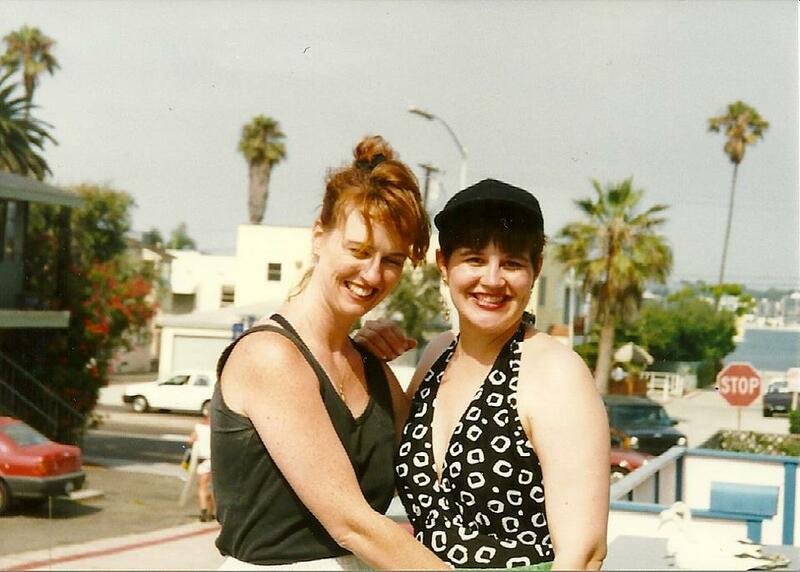 Here we are pictured in the 1990s, I think. There have been so many funny pictures taken over the years with great grins and poses that I am not sure. We always have enjoyed being hams and laughing. She is an awesome mother to two wonderful girls who I had the pleasure seeing grow up and getting to know. They are awesome just like their mother. And, her hubby, Bob, is funny and great to be around. She has an amazing family who I also love very much!! 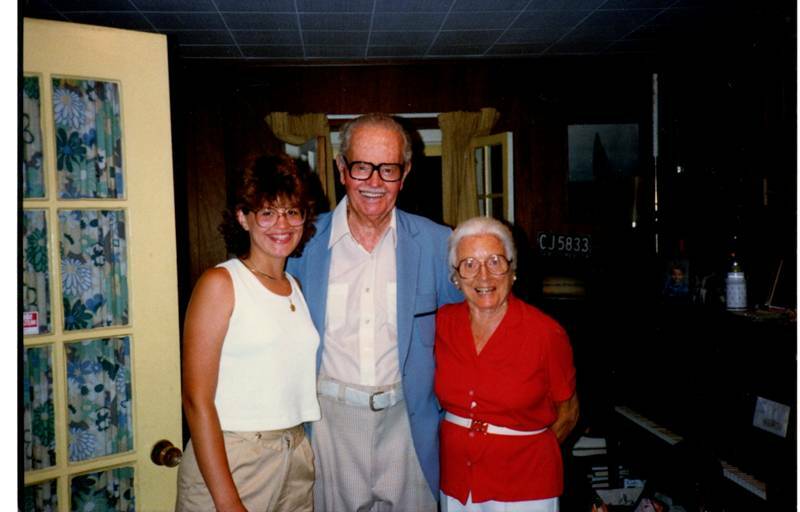 I will never forget the first time that my husband Kirk met Pam and Bob. We went to a Mexican restaurant in Old Town San Diego. The two guys cracked up and yelled at each other as if they’d known each other forever. I was thrilled to see how well they got along. It makes me laugh to think about! Now, Pam is a grandmother to a beautiful girl. Her oldest daughter is a great mommy! I can learn so much from Pam during Ian’s growing up years. Pam is less than 2 weeks older than me. We have been close for a long time. Pam has met Ian and is great with him, and so is Bob. Ian also got to meet their daughters, but not their granddaughter yet. Hopefully that will be soon! It has been several years since I have seen my cousin and I really do miss her! I do, however, love the fact that when we see each other, it is as if no time has passed. We pick up as we’d seen each other the previous week, not three of four years ago. It is awesome. I hope that you have someone like that in your life!! I love ya cuz!! And, can’t wait to see you in April of next year! YEAH!!!! It will be so much fun. So glad you had a great birthday! Here a five more days of photos from my photo-a-day project which continues for November. It continues to be fun! Enjoy!! 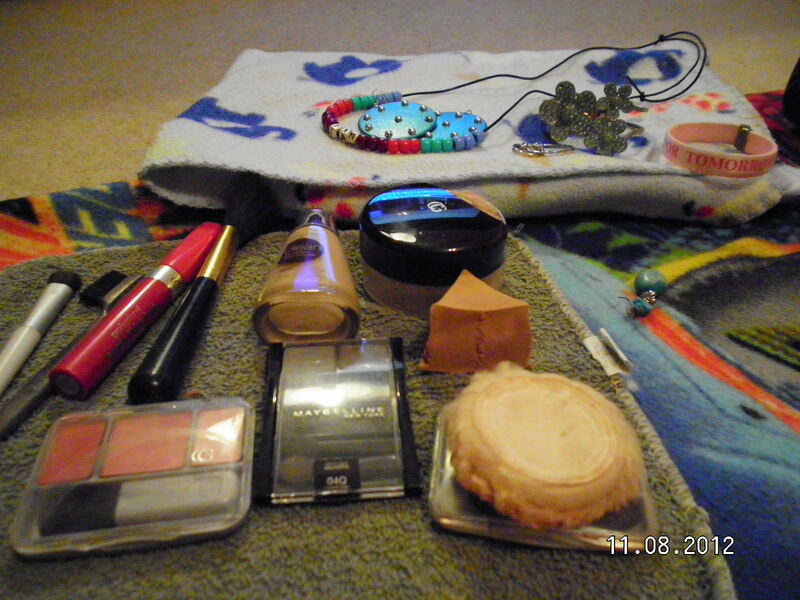 For this picture, I showed my makeup and jewelry. Each morning after my shower, I put on my makeup as I am watching Good Morning America. I then choose my clothes as well as the accessories I will wear for that day. When I am on vacation, or am having a lazy morning, I won’t do the makeup but may either wait until later in the day or skip it all together. I still watch my morning news show though. What do you do every day? I’d love to hear from you. 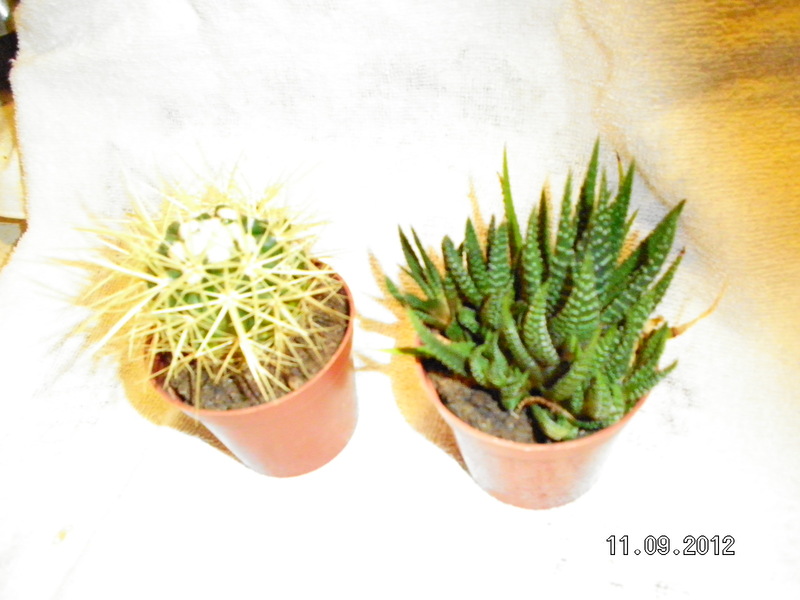 For this photo, I took a picture of two small cacti (or cactus for one of them). Including their pots, these plants are just a few inches tall. I had some trouble with the lighting but still liked the look of the photo. What do you think? 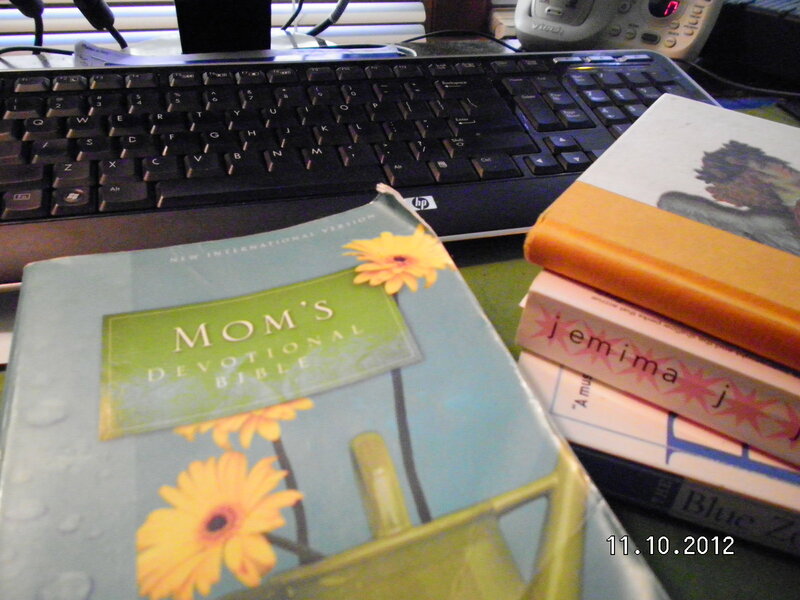 This is a picture of my Bible, my journal, some books that I like to read, as well as a keyboard. It shows that I won’t live without reading and writing. These two things are very important to me! I love to read and really enjoy a large variety of books and magazines. And, I am fascinated with the stories in the Bible! This particular Bible is my Mom’s Devotional Bible. I received it from my wonderful MOPS group the year I joined. I really like that the devotionals are included within the Bible!! And, writing is something I have in my blood. I have been writing for as long as I can remember and like a variety of that as well. The first two years that Ian was alive, I did almost no writing and truly missed it. I realized then that I won’t live without it any more. What won’t you live without? 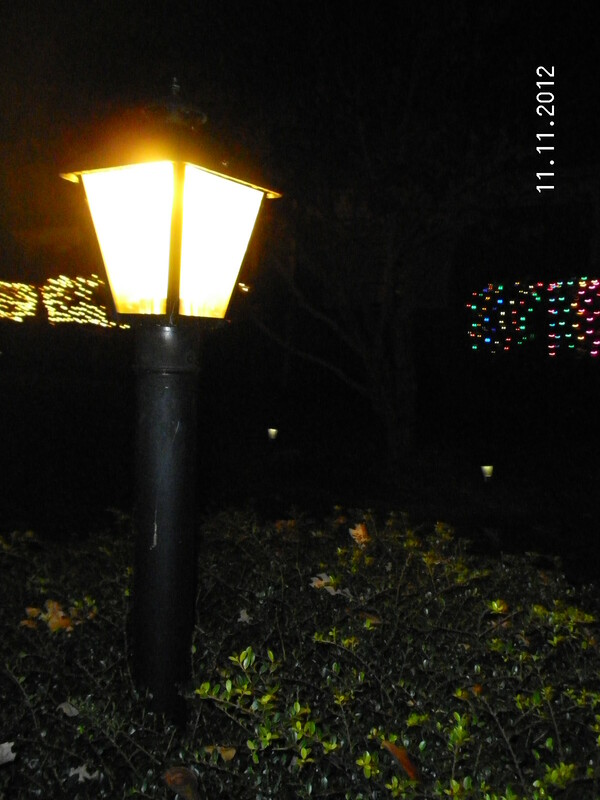 Here is a neat picture of an outside light at night. I like that it’s on the pathway/sidewalk near a family member’s house. My camera isn’t the best for photos in the dark, so I wasn’t sure how this would turn out. But, I am pleased with the results. You can also see the plants in the yard as well as the Christmas lights that have already been strung up. A little early for my taste, but this person wanted them up. Here are two drinks since I normally have two going at the same time. These are two of my favorite cups. In the one on the left, I have my reusable coffee cup. In that I have regular coffee with hazelnut cream. That is my normal morning drink — unless there are special creams like gingerbread or pumpkin spice. 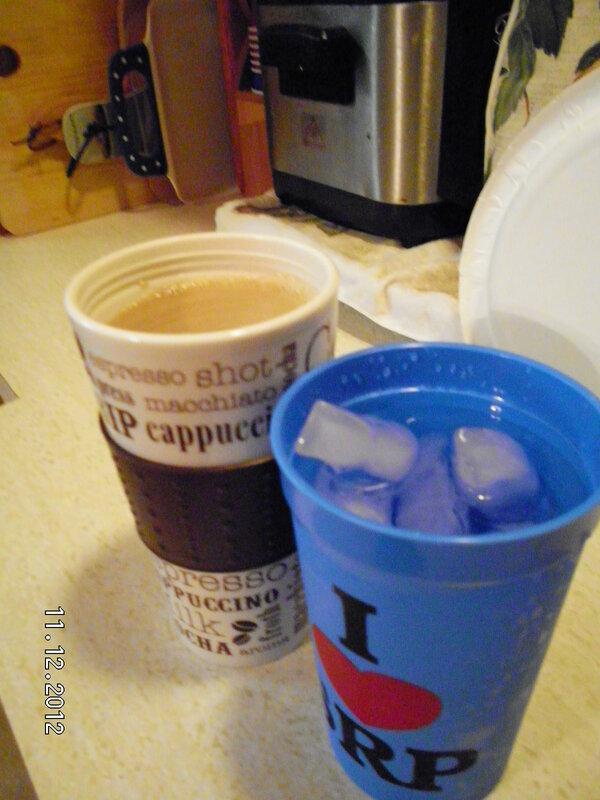 The second cup is filled with ice water. That is a drink I try to have each day, all throughout the day. It is in a cup of one of my favorite neighborhoods in the world. This is SRP and those who live there and visit there know it and love it. The location is magical as are the people. In a few more days, I will include another 5 days of pictures. Until then, take care and keep shooting!!! Happy Veterans Day! Yesterday was Veterans Day -on November 11. And, today is the holiday. 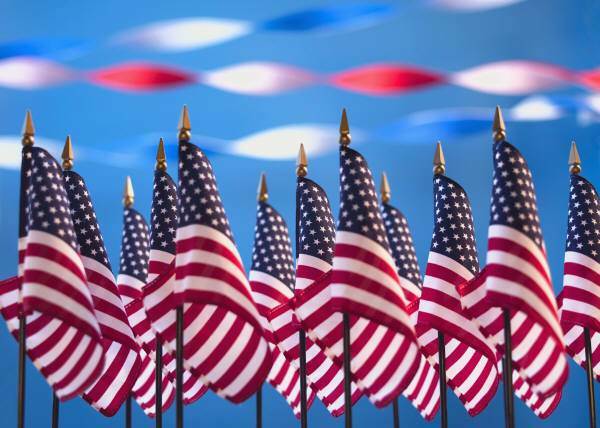 I want to say thank you to the men and women who are veterans and their families! The sacrifices that you have made are amazingly generous! I so appreciate you and your commitment to the United States of America. Those words are in a nutshell what these brave men and women have done for us! You rock. Hi and Happy Wednesday! Here are few more images for my photo-a-day project. It has been fun but I am frustrated with my camera. It is a point and shoot and quite limited with close-ups. I still, however, am having fun and learning to work with it. My husband also has a basic camera that I will have to try. 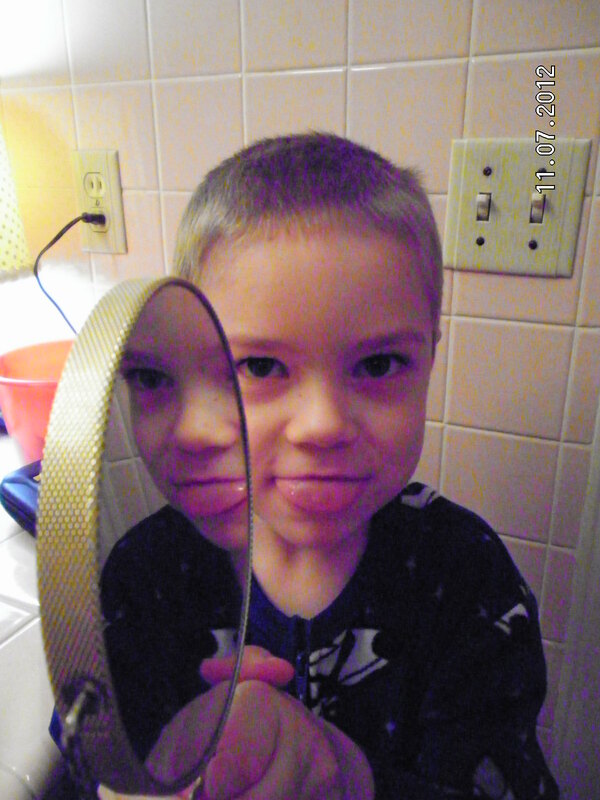 November 7 – “Reflection.” There were a lot of ways I could have gone with reflection – like the trees and leaves around a pond, a thoughtful look, or a boy making funny faces in a mirror. That last choice won out. 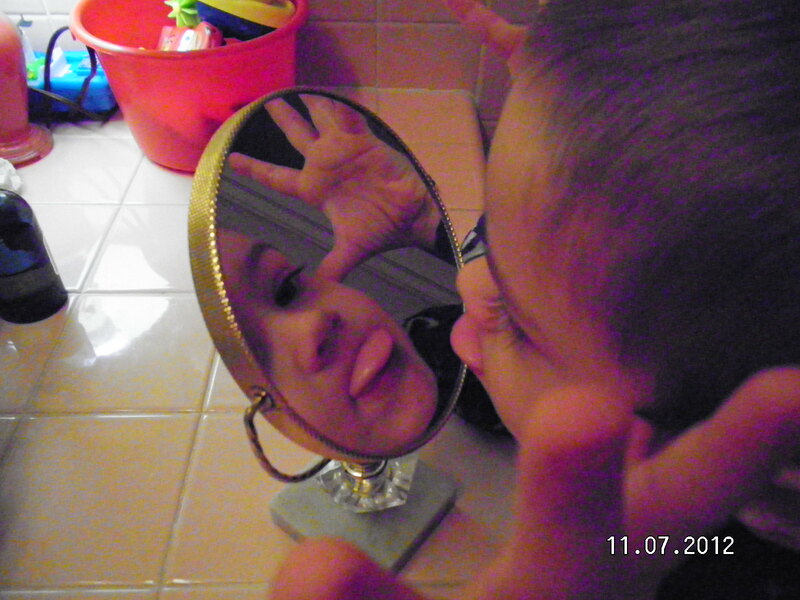 Ian enjoyed looking at himself in both the large mirror in the bathroom and the small round mirror. I like this first photo since it captured both of them. 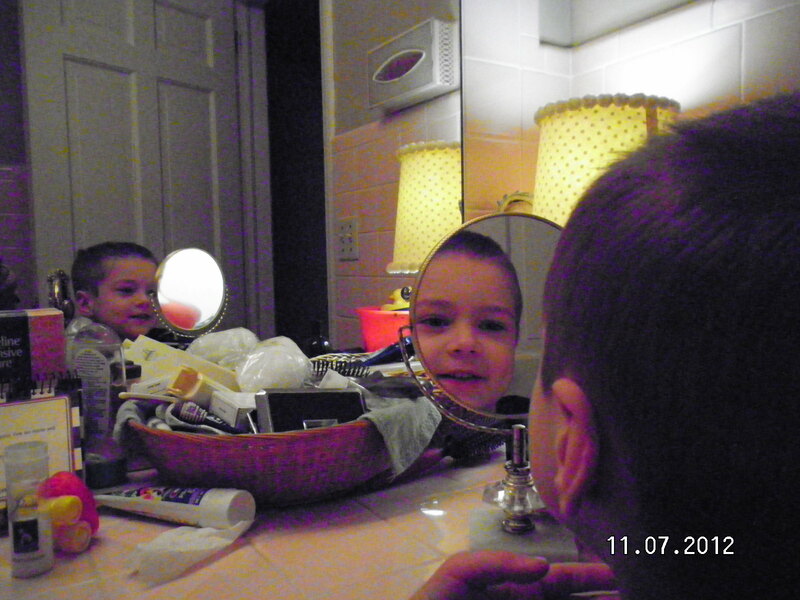 I also added these two other photos that I liked from Ian having fun in the bathroom. We just forgot to clean off the counter before we took these pictures. Ian really likes making silly faces and making bunny or reindeer ears with his hands. These photos capture that silliness quite well, don’t you think? I do love my funny son. Each day with him is a real adventure! When both Ian and I were babies, we stuck out our tongues quite a bit. And, when we are both really concentrating on a project or a thought, the tongue finds its way out. I am thrilled that I captured that in these photos. November 6 – “A Favorite Thing.” For this picture, I chose two necklaces that have real sentimental value to me. 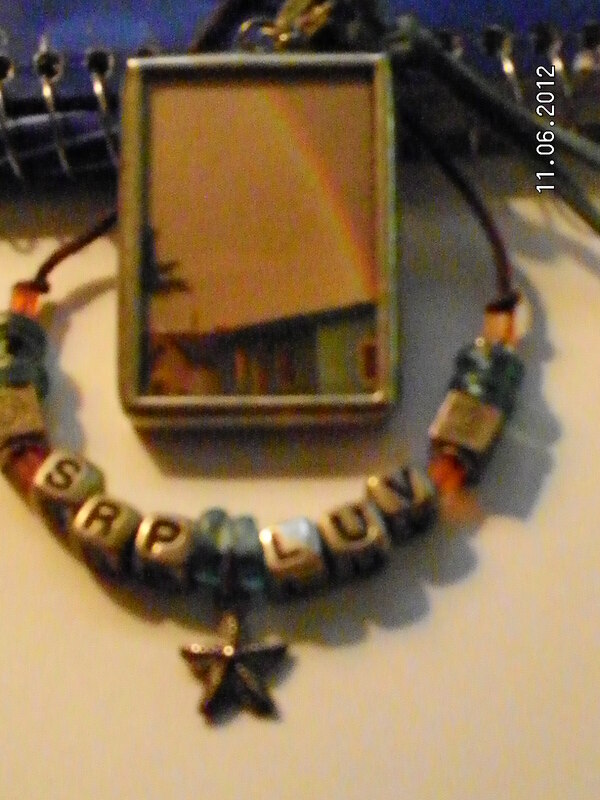 One necklace has the letters SRP LUV. I made this necklace at a bead store in honor of my family’s beach neighborhood in San Diego, CA. Both the neighborhood itself and the people who live there are very special and make the place truly memorable. 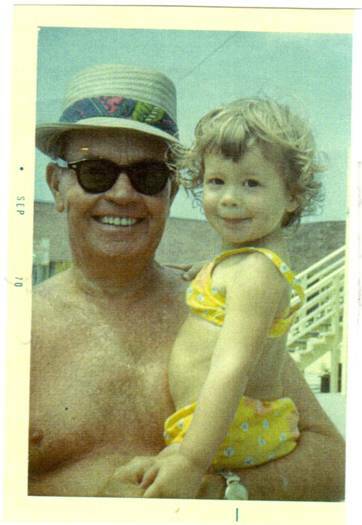 This is the beach community where I went as a child and spent time with my grandparents. They are gone, but new friendships have been made as well as more time with special family members. The second necklace is an amazing gift from my sister. One this side is a picture of the family beach house with a rainbow on it. On the other side is a photo of our grandparents on their honeymoon. I cried when I received this amazing and very special item. I wear both of these necklaces a lot and always think of my amazing family each time I do! November 5 – “5 O’Clock.” On this afternoon, I was talking to Ian and he said, Mommy can you take a picture of me with those scarecrows? I told him sure. 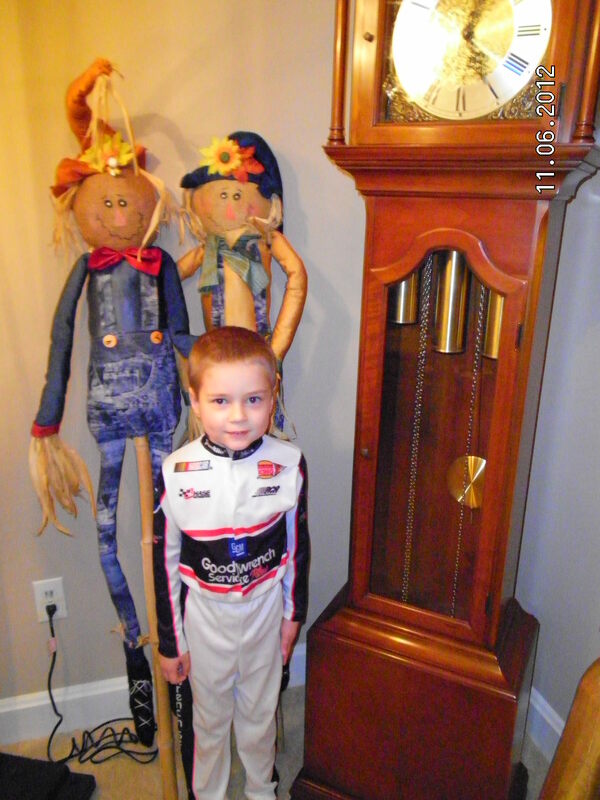 We posed the photo next to this amazing grandfather clock. I have always liked grandfather clocks. They are made by amazing craftsman or women. The only problem with this one is that it makes noise every 15 minutes. This can be difficult at night if I can’t sleep. And isn’t Ian cute in his race car outfit? This was given to him by his older cousin and he loves wearing it. November 4 — “TV” — This is an older television that was more like a piece of furniture. It is at what was my husband’s grandmother’s house. I received a lot of great comments from friends and family on this tv. I remember big and thick televisions were the norm when I was growing up. Now they are thin enough to hang on the wall. Amazing how that has changed. This television still works quite well, which to me is something. In the picture, you can see Ian watching a cartoon. He likes the ones on the Disney Channel the best. Each morning he likes to watch his buddies in their adventures. November 3 — “Breakfast.” A long time ago I learned the importance of breakfast. I try to eat a healthy one each morning. Of course, that isn’t always the case, but I do try. 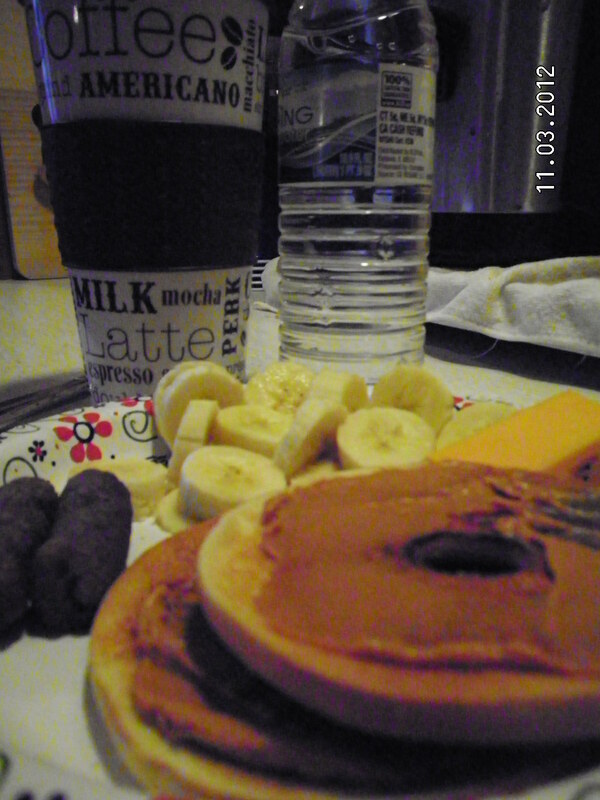 As you see in the picture, on this day I had sausage links, cheese, a banana, and a thin bagel with pumpkin spice cream cheese. I also had a bottle of water and coffee with hazelnut creamer. YUMMY!! These were 5 fun days of taking pictures. I look forward to the rest of the month and more pictures. Happy Photos! 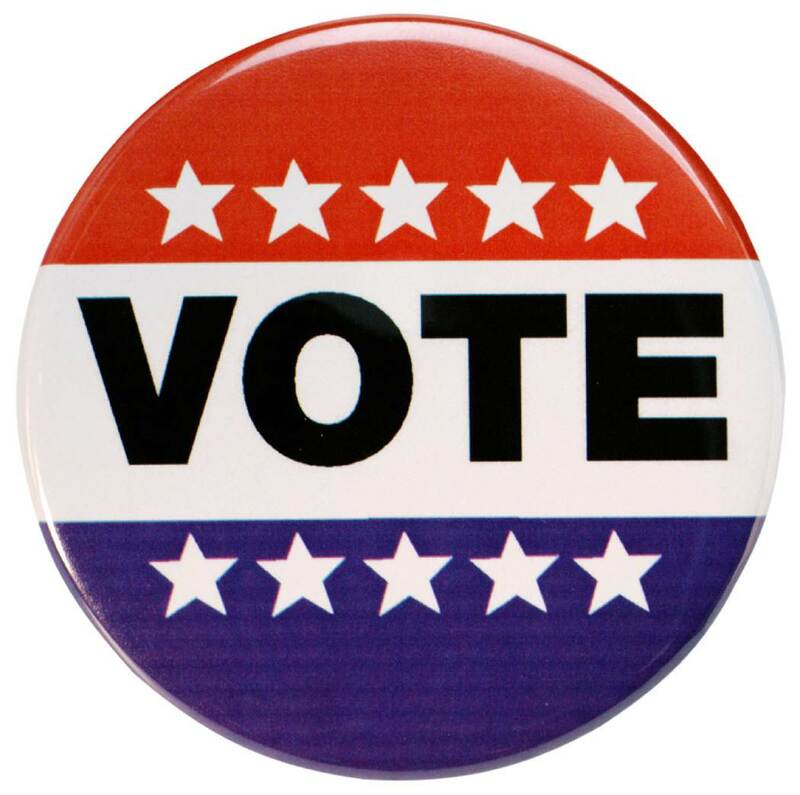 Today is November 6, 2012, Election Day. Have you voted yet? We as a nation are deciding between two men for President of the United States — the current President Barack Obama or former Governor of Massachusetts Mitt Romney. Some polls have said it will be a very close race and may take time to determine who is the winner, as in 2000. And others have said one candidate or the other will win by landslide. Who knows what will happen? I sure don’t since I am not a mind reader. Hopefully we will know by the time we go to bed tonight, but only time will tell. I do know that our chance to have a voice in this is by voting! I voted during the early voting time frame so I am all set. I am ready for a long and fascinating evening. It has been a long 18 months and I am glad that is finally finished. We listened to a lot of debates and statements during the primary season and now we are to the general election. I hope and pray that we as a nation can return to respect and consideration of others. The rudeness and snideness has been hard to listen to from friends and the media. I prefer for someone to stand up for their candidate without so much cutting down of the other candidate. This year seems like there will be a record turnout at the polls. That is great! I am glad to see so many people interested and voting. Quite a change from years past. May we choose the right man for the job of President and all of the other offices being voted on today. Have fun and be sure to vote! God Bless. Hi Friday and hi weekend! How are you? It is so good to see you! I don’t know about you but I am so ready for the weekend! Hope you have a great one. We will be busy for part of the weekend but also plan to have some time to relax and enjoy one another’s company. May you have a great one as well. Yesterday I started November Photo A Day, which is posted each month by fatmumslim.com.au. The lady at this Web site comes up with a variety of ideas of images on a list. My sister and a few of her friends did this last month. I wanted to try for November. Here are the first two images for the first two days of the month. I will share them at the end of each week with you, or sooner. **November 1 — “Something beginning with “C.” For this item, I chose Ian decorating Halloween cookies. This year, Halloween was a lot of fun with Ian. Throughout the day, he wore three costumes — a race car driver, Super Why (who has the power to read), and a skeleton. In the afternoon, we decorated cookies for Halloween. Ian had fun with the frosting, candy, and sprinkles. This pictures shows him hard at work. We also went to Ian’s favorite restaurant for dinner. 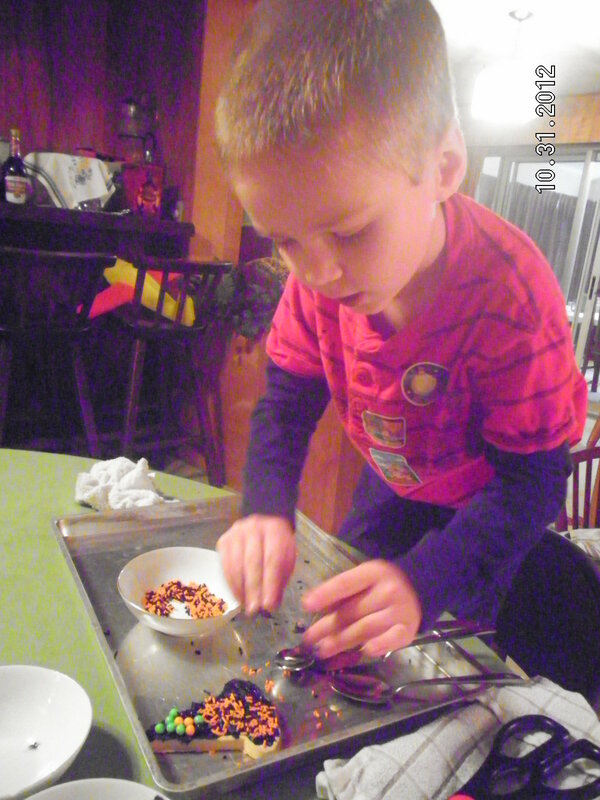 And, after dinner did trick-or-treating inside throughout the house since he has the sniffles. As he told me the next morning, “I had a great Halloween with you Mommy.” I told him that we had a great time with him too! **November 2 – “Colour.” For this image I chose to take a picture of a colorful scarf that my sister made me as well as an equally colorful necklace that Ian made with my mother’s help. 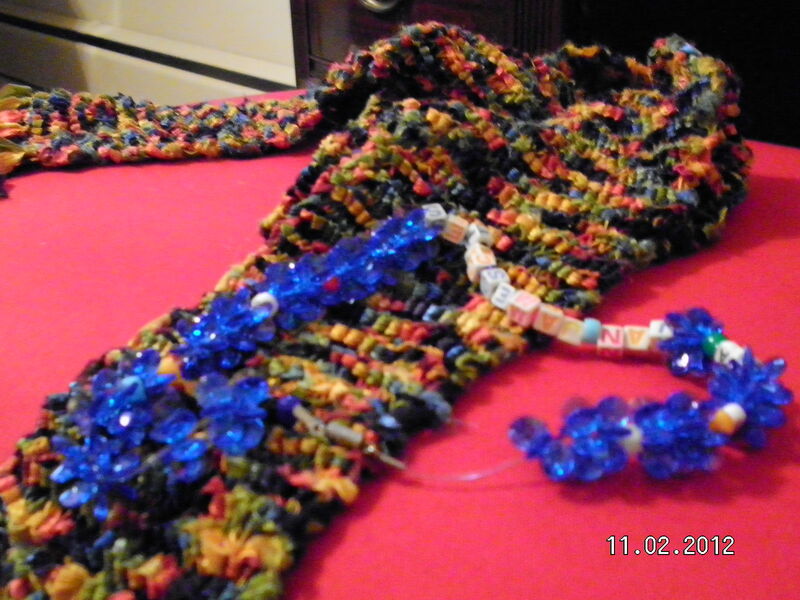 She crocheted this scarf out of a multi-color yarn of blues, oranges, and greens. I can wear it with many outfits and enjoy that each time I do. They are pretty but look a lot better in person. I need to work on lighting for the pictures as well as camera angles. This will be fun to work on as the month of photos continue. Do you have a favorite color? I do! Actually I have two of them — turquoise and red. The turquoise reminds me of the ocean which I dearly love. I also love turquoise jewelry and have quite a variety of pieces in my collection. And red is the color of love and passion. It is also nice that I almost always get compliments when I wear it. I have a ring that I bought at the beach years ago that is turquoise and red and it is one of my favorites! A few of the upcoming subjects will be — “breakfast,” “TV,” “something you do everyday,” and “tree.” I look forward to the adventure of figuring out what images to shoot and what to write about. Would you like to join me? Hope you have a fabulous weekend! Take care.